Identifying the needs to be met. Devising a plan to meet the needs. Doing something practical to meet the needs. Reviewing the extent of success in meeting these needs. Identifying further needs to be met. Each organisation can use The Big Picture in its own way to manage improvement, under the control of those who use the methods rather than an external evaluator. The Big Picture has been designed for and by the voluntary sector. The Big Picture seeks to provide organisations with an approach that treats quality and impact issues in a holistic way. Its starting point suggests that an organisation can be defined by the ‘results’ it brings about and the ‘enablers’ that help to make them happen. There are four sections to the model. 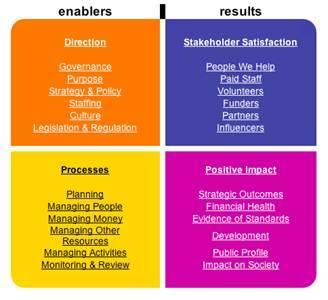 ‘Results’ in the model are interpreted as things that have a positive impact and ensure stakeholder satisfaction. ‘Enablers’ suggest that an organisation needs the right direction and appropriate processes in order to achieve the results. Each quadrant is then broken down into sixfurther strands. An explanation of The Big Picture so people understand roughly how it works. A general assessment of the organisation or project. Prioritising a strand to work on. Discussion of the chosen strand or quadrant. Action planning so that something happens as a result of the session. Review of actions taken at subsequent meetings. The Big Picture comes in the form of a workbook. Each strand in the four quadrants, such as ‘Governance’ under ‘Direction’, is explained in two pages of the workbook. These identify the key issues and list a series of tough questions to think about. There are also non-prescriptive practical ideas for action, case studies of other organisations that have used the particular strand to help improve their organisation, and an ability to ‘score’ the organisation’s performance in each area. It is possible to use the tool in ‘bite-sized’ chunks. Essentially, the framework asks questions of an organisation and assesses the need for change and then offers some practical ideas to plan, implement and review that change. The actions taken following that process are left with the organisation itself. The tool is simple and easy to understand and may be used ‘off the shelf’. It provides a diagnosis of an organisation’s activities and is useful for planning as it makes links between what an organisation does, the results it achieves and how the results are reached. It seeks to instil a culture of continuous improvement. It is flexible enough to be used in ‘bite-sized’ parts or for specific issues – such as ‘Governance’ as well as providing a framework for a more comprehensive review of an organisation’s activities. There is no requirement for external validation and the model can be used as an internally driven self-assessment tool allowing an organisation to be as honest and open as possible in gauging its performance. It has a high relevance and applicability to voluntary organisations of all sizes. Although there is an option for the organisation to assess itself using a ‘score’, the model does not involve any external validation or assessment. There is no formal mark or accreditation for the model and so it will not be overtly visible or recognisable to customers, service users, funders and other stakeholders. As it was developed for the voluntary sector, some social enterprises may find it is weaker for the more conventional business side of their work. Who can use The Big Picture? The model has wide applicability to organisations of any size, in all stages of development in the voluntary sector both in the UK and internationally. As with other frameworks, The Big Picture will be most effective if all staff are motivated and behind it. For a thorough diagnosis of the whole organisation’s activities, senior members will need to be involved in some capacity, but it has also been used by some organisations for a personal review of an individual’s work, for a training needs analysis, business plan analysis and as a stakeholder consultation tool, each of which has different leadership needs. In general, no specialist skills are required. The framework seeks to ‘get people talking’ and so an ability to facilitate discussion (in a variety of forms) will be useful. This will vary upon what the organisation uses the tool for. It may be used by an individual during a day or an hour to focus on one or two issues, or it is possible to use it to systematically address all the organisation’s activities over several months. Organisations can involve paid and voluntary staff, service users, customers and other stakeholders in the process. The Big Picture website contains basic resources, contacts and information on the tool and on-line group facilitation for organisations who want to hold group sessions but have difficulty with travel or access. The companion guide Getting Started with The Big Picture is recommended for people who want to ‘do it themselves’. In Scotland ‘peer supporters’ can show you how to use The Big Picture and can facilitate sessions. For a fee, SCVO can train people how to facilitate using the framework. The Peer Support Network is free for anyone who has a role to play in developing organisations, whichever framework or system they use. The Big Picture is produced by the Scottish Council for Voluntary Organisations (SCVO). 1. The Big Picture suggests that non-prescriptive changes should relate to the needs of an organisation not an external set of rules laid down by others.